Employers For Childcare comprises a Social Enterprise and a registered charity. 100% of the profits from our Social Enterprise businesses – a Childcare Voucher company, a recruitment service for childcare providers and High Rise (an indoor family adventure centre) are invested into our charity. As a charity, our aim is to make it easier for parents with dependent children to get into work and to stay in work. We address childcare as a labour market and economic issues, as well as a social one. Social Enterprises are businesses that trade to alleviate social problems, improve communities and enhance people’s life chances. They make money from selling goods and services in an open market, but they reinvest their profits back into the business or the local community to maximise social impact and to create social change. They do this in lots of different ways: creating jobs for people who may be marginalised, reinvesting profits in community projects or charitable work, protecting the environment, or providing vital services for people who might not get them otherwise. families across the UK: our charity (funded through our Social Enterprise activities), advises working parents on what financial support they are entitled to, and lobbies policymakers on their behalf. While Childcare Vouchers closed to new entrants on 4 October 2018, existing users who have already registered for Childcare Vouchers, can continue to use the Scheme, as long as they remain eligible. For further details on this, contact our Family Benefits Advice Service on 0800 028 3008. Employers can also choose to switch their Childcare Voucher provider company – if you are interested in buying social, why not find out more about making the switch. Remember, it doesn’t cost you anything but benefits families across the UK! 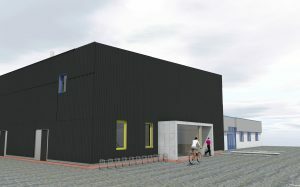 In 2019 we’ve embarked on a £2.5 million build-project of a new family adventure centre called ‘High Rise’ at our existing premises on Altona Road, Lisburn which will create up to 50 new jobs. High Rise is designed to be inclusive and will feature an innovative sensory room and quiet room benefiting a range of users, including children with additional needs, as well as a Changing Places accessible toilet. As a Social Enterprise, the profits from High Rise will be invested in Employers For Childcare’s charity which supports working parents. Artist’s impression of High Rise. To stay up-to-date with the latest developments with High Rise, like our Facebook page. For childcare providers in Northern Ireland, we help to remove the time and hassle involved in finding staff by offering tailored recruitment packages. 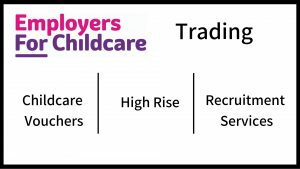 Email hr@employersforchildcare or click here to find out more. Why is being a Social Enterprise important to us? Aoife Hamilton, Policy and Information Manager, explains the importance we place on being a Social Enterprise. How do we support parents through the investment from our Social Enterprise? Aoife Hamilton, Policy and Information Manager, describes our charitable work that is funded by our Social Enterprise. How do we make a difference to working families? Chris Briggs, our Senior Family Benefits Advisor, explains how our Family Benefits Advice Service makes a difference to the lives of working families.